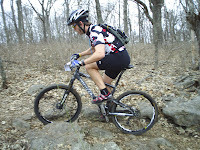 The annual Spoke Pony Showdown 3/6hr race was finally held at Landahl this weekend after being cancelled due to trail conditions two weekends ago. 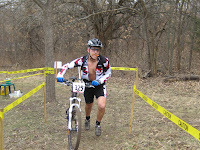 The course conditions were great and the temperature was in the upper 40s. 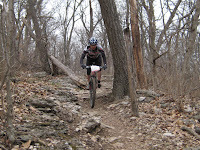 Shad Schreiner took the overall 1st place in the 3 hour solo. 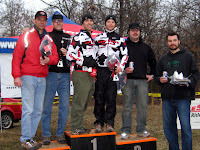 Rich Anderson and Randy Cartwright took 1st place in the 6 hour duo. 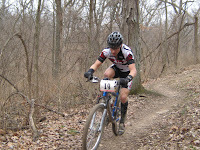 Tige Lamb finished 4th in the 6 hour solo, 30 -39 class. The girls of Punk Rock Cycling have come up with a cool info sheet about criteriums called Criterium 101. It covers the basics like what is a leadout, how do I earn a prime and why would I "take a flyer". There is now a tiered scale of points based on how many participants were in the race. In some cases, this will make it easier to upgrade, especially in classes with small fields, but it will take more races to do so as the points are fewer. If road races do not meet the distance requirement to be considered a road race, they may still be long enough to be considered a criterium or circuit race. In that case there is a different points table to use, but points would still be available. 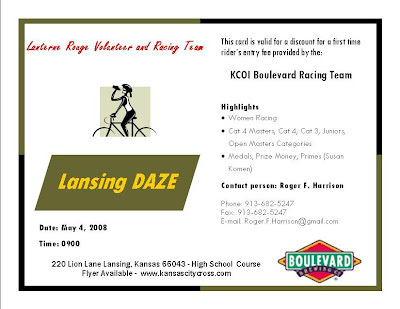 First Time Rider Discount at Lansing DAZE. The Perry Road race series is a wrap. 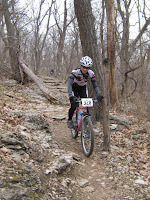 Thanks to The Lantern Rouge and the Wheatland Cycling Team for bringing this fun series to us. And as always, thanks to all the USCF officals and volunteers that make these events possible. Just as the weather is starting to improve and Spring is in the air, two local riders recently have been put on the disabled list due to injuries. Roger Harrison had surgery to repair his ailing knee. From Roger "Due to the result of the surgery performed on the Lanterne Rouge this afternoon, the prognosis of a slow recovery will cause this Category Six rider to miss the start of the 2008 Tour De France. Local racers should be wary of any of his entries as he attempts to return to his elite status form by racing in the Kansas, and Missouri areas. 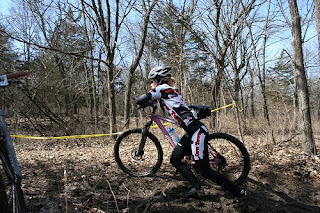 The Lanterne Rouge's surgery, performed by the Veterans Administration, has proven the elite status of this hospital and their staff"
Cow Town Cycling's Ashley Blum was out training on the Landahl trails in preparation for the start of the 08' mountain bike racing season when he crashed on one of the many technical sections. A visit to the doctors office showed a broken bone in his wrist. When asked for a comment the only thing Ashly said was "Never try to keep up with Rich on Rim Job..."
We wish a speedy recovery to Roger Harrison and Ashley Blum. Some cool photos by Andrew Slatter are on his Flicker site. Round #2 of the Dam Race was held today out at Perry Lake under 'much more pleasant' conditions. Roger Harrison and Adam Gatewood again put on a fine event. 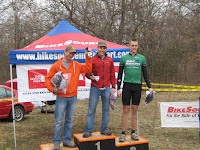 Joseph Schmaltz put in a great ride to win today's Men's Cat 1/2 division. Cow Town had a strong showing thanks to Shad Schreiner as he won for the second week in a row. Chris Locke 'suffered like a dog' to take 8th in the Men's 3's and is looking forward to getting back into his element at the Spoke Pony. Pictures at Roger's House of Photos. Ride with the Devil a Go! 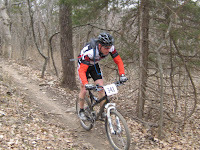 The Ride w/the Devil Mountain Bike race is this weekend out at Clinton Lake State Park. Currently the trails at Clinton are as expected a muddy mess, but plans are underway to layout an alternate course that uses grass lands, pavement, gravel and tree lines. A group is meeting Saturday morning at the Corps of Engineers office (10:00 a.m.) to begin planning and working on the alternate course. 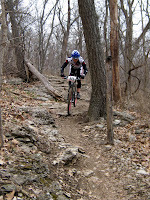 Looks like good turnouts for the Spring Fling and Perry Lake road events. At both events wind was a deciding factor. 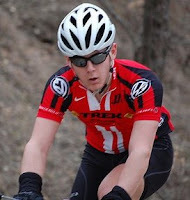 Congrats to our own Shad Schreiner for winning round #1 of That Dam Race. Perry Lake RR (That Dam Race) result HERE.